Perhaps I just had a good day for it, but the conditions underfoot were as good if not better than those you might experience in many parts of the country, making for quick progress and allowing you to keep your head up rather than focusing on your next step.. Yes there is some erosion on the track up from the Vee over the Sugarloaf, but the dry summer appears to have helped somewhat. Ok, the excitement and interest of other areas may be lacking, but on a clear day the Knockmealdowns to my mind present a fantastic viewpoint, allowing long-distance views to the Waterford coast, the Nire Valley in the Comeraghs to the east, the Galtees to north-west and Slievenamon to the North. 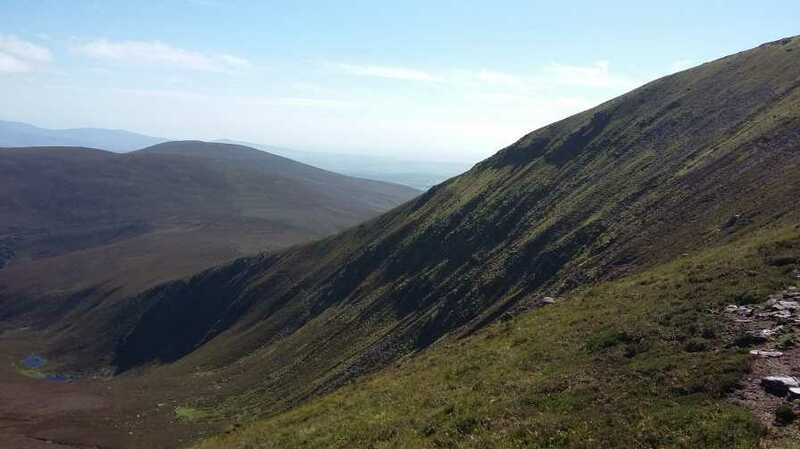 Whilst care always needs to be taken, particularly around the northern rim of the Knockmealdown coum, the hazards are few and the tracks and wall offers guidance should mist or cloud gather. The picture was taken from the "col" between Knockmoylan and Knockmealdown, looking east into the coum, trying but just about failing to capture both the lakes in the lower coum and the trig pillar on the summit of Knockmealdown.